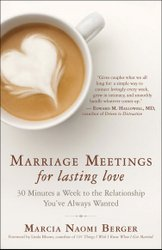 Marriage Meetings for Lasting Love: 30 Minutes a Week to the Relationship You’ve Always Wanted (February 2014, New World Library). This chapter introduces the concept of a weekly Marriage Meeting, a step-by-step process that has helped thousands of couples to keep their relationship on track.I believe in marriage. My mission is to help people have fulfilling marriages that support the growth and vitality of husbands and wives. Would you like to experience more intimacy, romance, teamwork, and smoother resolution of conflicts with your life partner? You can make your dream come true for the relationship you’ve always wanted.This book provides step-by-step instructions for couples to conduct a weekly Marriage Meeting, with a simple four-part agenda introduced in this chapter. This chapter stresses the benefits of formality and regularity of Marriage Meetings. It gives the nuts and bolts of how to prepare for one, including how to schedule meetings, when, where, and how often to meet, how to set the agenda, and how to deal with a partner who is reluctant to participate. Couples will re-connect during their meetings by adhering to the prescribed structure, logistical details, and etiquette for the meetings. Each week they reaffirm that “we are in this together.” The meetings provide closure routinely, freeing up energy otherwise be spent worrying, wondering, or begrudging, because they talk about and resolve concerns that otherwise might get lost in the shuffle of everyday life. This chapter describes how to conduct the first part of the four-part Marriage Meeting. Part one sets a positive tone for the entire meeting.The goal is to create a warm climate and a feeling of connection. A key technique for positive communication is introduced in this chapter. The focus of this chapter, which describes how to conduct part two of a Marriage Meeting, is on improving teamwork. This chapter tells how to conduct part three of the Marriage Meeting, which is all about keeping intimacy flourishing and rekindling the romantic spark on a regular basis. Marriage is an alliance entered into by a man who can’t sleep with the window shut, and a woman who can’t sleep with the window open,according to George Bernard Shaw. The fourth part of the marriage meeting is the time talk about any issue, and to explore and seek solutions. Case examples in this chapter will demonstrate effective communication skills that will be explained in more detail in the next three chapters. This chapter illustrates how to use seven communication skills that create harmony, good will, and priceless feelings of connection. Case examples and anecdotes show how people learn to transform negative communications into positive ones that build trust, intimacy, caring, and cooperation. Worksheets are included to encourage people to prepare for and practice using these skills during Marriage Meetings. Three chapters in this section show in detail how marriage meetings helped couples address common relationship challenges. These chapters show how each couple is able to increase intimacy, mutual appreciation, and teamwork, and to resolve conflicts more smoothly. Chapters 13 and 14 show how marriage meeting techniques are integrated successfully into couple therapy sessions. This chapter wraps it up with recommendations for how to implement the Marriage Meeting Program in a way that assures that you will accomplish your goals. Weekly meetings remind you that you value each other and your relationship. They foster direct, positive communication that addresses concerns at a time when both of you are likely to be receptive. Issues are resolved and challenges are met before they escalate into crises or grudges. Answer: “Just talking” is fine and certainly desirable on a daily basis. It is easy, however, with all life’s pressures, to communicate in ways that do not foster a positive connection or resolve issues to your mutual satisfaction. The weekly marriage meeting basically covers all bases; whatever is important is likely to get mentioned and handled successfully, and you are likely to maintain good feelings about yourselves and each other.